Well I don’t know about “Lil” as this guy had a big big baritone voice. Listen To Me is proof that he meant business all right. Power to spare. This well constructed blues ballad from Atlanta, with strong horn support and intricate lead guitar lines, has been a favourite of mine for a long time. The jive based blues shuffle flip is pretty good too. Did Roy cut any other discs? 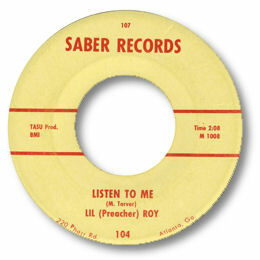 UPDATE ~ Mike Gray writes about "Wontcha be my girl" and says that "Atlanta, Georgia was the home of Saber Records, responsible for the jazzy 1963 R & B performance of the mysterious Lil (Preacher) Roy. The song was written by Mary Tarver, a Dallas- based writer who had written some cool rock 'n' roll classics fro Gene Summers such as Nervous, Twixteen and Straight Skirts. Check out the beboppy tenor saxaphone solo on this great track." My thanks to Mike for the extra info.